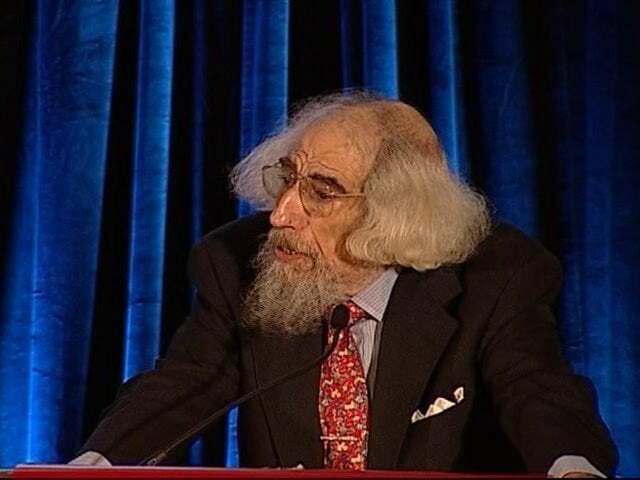 Jonathan Z. Smith delivers his plenary address at the 2010 Annual Meeting of the AAR in Atlanta, GA.
As should be evident, there is a tremendous challenge to writing about Jonathan’s life and career. For his professional contributions are already well known, inasmuch as reading Jonathan’s work (from the set of early essays that appeared as Map Is Not Territory [Brill, 1978] to his most recent, edited collection, On Teaching Religion [Oxford University Press, 2013]) has long (and rightly) been de rigueur in the field—whether tackled in classes by undergraduate students, as preparation for comprehensive exams by grad students, or simply in the current literature by colleagues—whereas his personal life was just that, personal, and generally not the topic of public record. This means that for many he is an utterly familiar figure, at least inasmuch as they have regularly met him in his pages as an author or perhaps because they would annually spy his characteristic profile across hotel lobbies or in the hallways of national conferences, perhaps hearing him deliver a paper in what, as he aged, became his slow and steady style, leaning over the podium, reading from his typed or, just as likely, handwritten manuscript. But yet, for these same readers, he more than likely also remains an utterly unfamiliar figure, for only those who knew him personally may have also met his gracious wife, Elaine, or known of his daughter, Siobhan, along with his son, Jason and his wife Rachel, or perhaps the granddaughter he loved so much and would happily speak about if asked, Hazel, and even his sister, Pamela, all of whom survive Jonathan. For readers may have known that he grew up in Manhattan, had an early interest in agrostology (the branch of botany that deals with grasses—hence his life-long interest in taxonomy), did his undergrad in philosophy at Haverford College, then developed an interest in the demythologizing work of Rudolf Bultmann (and thus we see his entrée to New Testament studies), which then led to two years of study at Yale Divinity School—in his own words, “interacting on a daily basis with tribal Protestants” which, he went on to say, “was analogous to an anthropologist’s fieldwork”—before moving to Yale’s new Department of Religion, where he earned his PhD in 1969 (in what was then new field of history of religions) by writing a 574 page (unpublished) dissertation, “The Glory, Jest, and Riddle: James George Frazer and The Golden Bough,” all the while becoming the first new faculty member to be hired into the University of California at Santa Barbara’s just-established Department of Religious Studies (beginning there in 1966), all of which was prior to him leaving California, two years later, for what turned out to be an almost fifty year career at the University of Chicago, let alone knowing of his vegetarianism and conscientious objection (all of which can be learned from his informative “bio-bibliographical” essay, “When the Chips Are Down,” which opened his 2004 collection, Relating Religion: Essays in the Study of Religion). But those familiar with such public details may not have known that he lived in Hyde Park, a short walk from his university office, or that his home had been in a greystone originally built for the 1893 Chicago World’s Fair (near to the lakeshore, back in pre-air conditioning days, originally lacking window panes so as to catch the lake’s summer breeze, he once said), which has long been filled with art and newspapers and whose upper floors housed his home office as well as rooms that had been converted into library stacks for his books. They would likely also not have known of the simple manner in which he lived, his love of his garden, the kind generosity he could show to people, not to mention that he’d often have his birthday fall during our main annual conference in November or the “Hutzpah is not hubris” sign that appeared in his office at the university (something students attending his office hours might know about, of course), as well as the honor felt by his correspondents when receiving one of his neatly printed, handwritten letters. (Yes, as per the lore, he did not use computers and, when possible, tended to stay away from telephones, not to mention the Internet and social media—which makes the hundreds of comments that I saw on Facebook and Twitter, let alone the various blogs posts on his work that have appeared in the days following news of his death, so moving, inasmuch as it signifies that a new generation that had never met him also feels this loss.) Only if they’d read the delightfully meandering and, at times, revealing, interview done with him by the Chicago Maroon, an independent student newspaper, back in June 2008 (and still available online) would readers know that the tree-trunk of a cane that he always had with him, as he got older, and on which he would lean, chin-on-hands-on-top-of-it, while seated, staring at the floor, listening intently to papers being read at conferences, was made by his uncle, from wood that was, as Jonathan described it, “liberated” from the Great Smoky Mountains National Park. And while they’d also probably know of the rumor that one of our field’s most critically-minded scholars lived next door to an abandoned church (built in 1917), what may not have been evident was that it still sits empty today not because of an intellectual dispute over the place of the sacred (a scenario some in the field might like to imagine, given the nature of Smith’s work) but, rather, due to a neighborhood dispute over its redevelopment as condominiums. Ironically, perhaps, it was the encroachment of secular that proved intolerable. And so it is this relationship between the familiar and the strange—things known and things undisclosed—that strikes me as a fitting lens through which to view Jonathan’s life and career; in fact, it’s an especially apt viewpoint given his own work’s recurring focus on how knowledge is produced by the comparative method’s navigation of just these two poles. So, concerning his professional accomplishments—and, remember, with just this lens in mind—a familiar in memoriam would surely report that Jonathan was a longtime member of, and frequent contributor to, the American Academy of Religion, the Society of Biblical Literature (of which he was president in 2008), and the North American Association for the Study of Religion (where he also served a term as president, from 1996 to 2002), and that he was also a member of the American Academy of Arts and Sciences (elected to its philosophy and religious studies section in 2000), an honorary life member of the International Association for the History of Religions (awarded to him in 2013), and the recipient of both the University of Chicago’s Quantrell Award for Excellence in Undergraduate Teaching (in 1986) and the Yale University Graduate School’s most prestigious honor, the Wilbur Cross Medal (in 2015). It would also observe that after first holding the University of Chicago College’s William Benton Chair in Religion and the Human Sciences (beginning in 1974), he was later (in 1982) named the Robert O. Anderson Distinguished Service Professor of the Humanities, a position without the usual requirement of a departmental affiliation (also the emeritus status that he held once retired, just a few years ago), and that he was the onetime program coordinator of the religion and the humanities as well as the early Christian literature programs at the University of Chicago College, and that he also served on the university’s Committee on the Ancient Mediterranean World, the Committee on the History of Culture, while eventually being reappointed as an associate faculty member at the Divinity School. Such a traditional remembrance would undoubtedly also point out that he was not only a prolific essayist, a dedicated teacher (repeatedly placing special emphasis on the importance not just of undergraduate education but, more specifically, core curriculum or general education courses that were in the service of helping students to learn to think broadly and critically; in fact, it could be argued that all his writings had a pedagogical engine driving them, whether they were explicitly on teaching or not), and an intellectual provocateur but, from 1973 to 1982, he also served for a decade as a university administrator (first as an associate dean and then, from 1977 to 1982, as dean of the University of Chicago College). Alongside those accomplishments it would surely also be noted that there are now six collections of his essays in print, with many more published articles, chapters, introductions, and replies left uncollected—in fact, his first published essay in the field, placing the origins of logion 37 of the Gospel of Thomas in “archaic Christian baptismal practices,” was published by History of Religions in 1966—and that he edited The HarperCollins Dictionary of Religion (1995), a resource in which he himself wrote no less than 487 unattributed entries (see pages 397–400 of Relating Religion for the complete list). And we’d also learn that his various roles over the years on advisory boards, the book reviews that he wrote, and the invited lectures that he offered at universities around the world are simply too numerous to begin to catalogue (or even for him to itemize on his own CV). Such a familiar summary of his career would also include his year as an instructor at Dartmouth College (1965–66) and his early and lasting friendships with both Jack Neusner (1932–2016), whom he already knew, and Hans Penner (1934–2012), whom he met there that year—the former playing a key role in the publication of Smith’s first book and the latter playing a key role in his early and developing sense as a scholar of religion. Such a remembrance would, of course, not fail to make special reference to the early mentoring he received from Mircea Eliade (1907–1986), whom he reported first meeting on, of all times, Valentine’s Day 1968, while Eliade was a visiting professor at Santa Barbara and Jonathan had just returned from his job interview at Chicago—“I count my association with him as one of the great gifts in my life,” Jonathan wrote (Relating Religion, 13). In fact, it would have to be remarked that among his last original pieces was the introduction that he wrote to the 50th anniversary edition of Eliade’s The Myth of the Eternal Return (2005), a book whose descriptive chapters have, in Jonathan’s words, “stood the test of time.” And, of course, such a proper remembrance would not be complete without mention of Jonathan’s eventual resignation, in 1977, from his initial appointment to the Divinity School. But having documented his field-shaping accomplishments, with which readers are already well acquainted (many of which, by the way, were carried out just as the academic study of religion was taking hold for the first time across US universities, public and private), and thereby offering a testament to him “in the proper and customary manner” (as one of his own epigraphs, taken from George Bernard Shaw, once put it; see the opening to his now classic essay “The Bare Facts of Ritual”)—a fitting tribute that, at some point, would surely have to quote his now (in)famous line from the opening of Imagining Religion (1982) concerning the creation of religion in the scholar’s study—what still remains to be explored is the unfamiliar; and for me, that was his wit. For I think that many fail to read his work with a sufficient sense of irony, failing to “get” the joke that he occasionally made in his writings, as a result of his having put two seemingly unlike things beside each other in some novel manner. (That’s just what comparison was, for him: placing unconsenting items together within the confines of a scholar’s imagination, in pursuit of his or her own curiosities; on this see Drudgery Divine, 115.) After all, as he himself reported, he went into the study of religion “[b]ecause they’re funny…. They relate to the world in which I live, but it’s like a fun house mirror: Something’s off. It’s not quite the world I live in, yet it’s recognizable. So that gap interested me” (see the previously cited Chicago Maroon interview). Religions, then, are both familiar and strange. So in the midst of the serious and erudite (for some, even intimidating) scholar who he was widely assumed to be (by all reports, though patient, he did not suffer fools gladly—to borrow an old phrase from 2 Corinthians 11:19) there remained the mischievous but often undetected jest. (For example, that often quoted line about religion being “the creation of the scholar’s study” is a crafty double entrendre that few, I think, detect, inasmuch as it references both our work and the place in which we do it—an effect also achieved by his preference for gerunds.) But none of these were simply a bon mot; instead, they were always indicative of some larger, theoretical point; they were each an e.g., as he might have phrased it: something interesting, not in and of itself (for, as he often remarked, nothing could be interesting, or even known, if it was so unique as to be self-contained), but only inasmuch as it pointed to something else, signifying its relationship to something that we, as scholars, have seen before, such as the playful (sometimes maddeningly so) ambiguity of language and of social life. My people have stood for 5,000 years and now they’ve fallen?! And then he laughed, as we did as well. This is the Jonathan whom I choose to remember—keeping in mind that, as he also told us on more than one occasion (such as in the concluding lines of his dictionary’s Note on Transliteration), the apparent descriptions of scholarship are always a translation that bears the marks of the translator, and so are never an idle presentation of some pristine original (and thus that unavoidable gap reappears once again); he was the one who not only saw each item of knowledge as illustrative of some wider point but, because of that, understood knowledge itself to be what we produce when we put two unlike things together in a provocative, sometimes surprising, maybe even accidental manner, such as a Levy and a levee. Moreover, that memory illustrates so nicely that while devoting a lifetime to studying religion, none of it ever really was about religion, at least as I understand him, but, instead, the various things commonly designated as religion—such as myths or rituals, scriptures and symbols—always provided him with opportunities to talk about people from the past, who happened to leave things for us to examine, who were themselves trying to address the gap that so interested him as well—whether they were devising ways to manage the distance between us and them, the proper and the improper, the tame and the wild, the planned and the accidental or here and there and now and then. It was in that playful, but always consequential, middle space, somewhere between the strange and the familiar, where this thing we just call culture takes place and it was in that same ambiguous, middle space in which I see Jonathan’s life and work to have taken place, often with a wink, sometimes a laugh or maybe even a scowl (though playful, the stakes were always high), never by means of a computer but, whether teaching or conversing, always with plenty of gestures, shrugs, and expressions. Russell T. McCutcheon is professor and chair of the Department of Religious Studies at the University of Alabama. With Willi Braun, along with the input and permission from Smith himself, he has co-edited a collection of interviews conducted over the years with Jonathan Z. Smith, which will be published in mid-2018 by Oxford University Press. The volume will also include Smith’s last, unpublished AAR plenary address, originally delivered on October 31, 2010, along with then AAR President Ann Taves’s introduction of Smith.